Recycling at UofL is comprehensive and easy...but it depends on your cooperation! In 2017, UofL recycled, composted & reused over 23.2 million pounds (77.8%) of our waste! Yet we are continuing to produce more total waste every year. 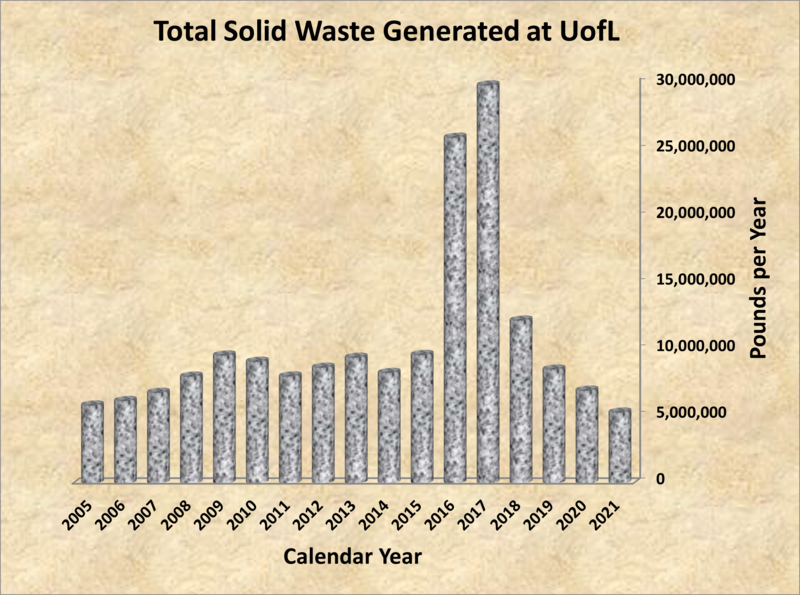 2013 was the last year in which UofL reduced its total annual waste generation - in that year, we cut our waste by over 886,000 pounds (a 10% reduction from 2012). We must continue to tackle waste generation. Reducing - avoiding unnecessary purchases, resource consumption, and excess packaging. Reusing - choosing reusable items (mugs, bottles, bags, napkins, dining ware, filters, rechargeable batteries, etc. ); and swaping surplus property or donating items to the UofL Free Store in the basement of Unitas Hall (donation bins and entrance off Cardinal Blvd near Brook Street). Recycling - all of the items listed below! 2019 Recycling Bin Hackathon with FirstBuild! The student group, GRASS, got UofL to up our recycling game back in 2009! Any recycling bin on all three UofL campuses can be used to recycle all types of paper, cardboard, plastics, metals, and glass. It doesn't matter what color, number, or how clean or empty your item is (though, if you have a chance to dump out food scraps or liquids, please do). If you think it might be recyclable, please put it in one of our single-stream bins. Small amounts of contamination will be sorted out. PAPER: All types of paper products: plates, cups, cartons, bags, wrapping, magazines, softcover books, notebooks, newspapers & inserts, glossy paper, mail, envelopes & office paper, etc. Don't worry about clips, staples, clasps, or spiral bindings. NOT recyclable: tissues or paper towels/napkins (though these are ideal for composting),wax paper, laminated paper, or any paper bonded to foil or plastic (e.g. bubble mailers). CARDBOARD: All types of corrugated cardboard (including pizza boxes), paperboard, food boxes/trays, catered lunch boxes, coffee cup sleeves, folders, toilet paper rolls, and cartons (e.g. eggs, milk, juice, soup, etc.). Please flatten boxes to save space in bins and reduce our costs (we pay for recycling by VOLUME, not weight). Don't worry about stains or crumbs, but please dump out food scraps, plastic films, and liquids if you can. NOT recyclable: waxed cardboard (e.g. waxed produce boxes). PLASTIC: All types, numbers, and colors of hard plastics: bottles, cups, containers, dining ware, lids. Don't worry about residues or crumbs, but please dump out food scraps and liquids if you can. NOT recyclable: Plastic films, wrappers, chip bags, shopping bags, diapers, condiment packets, any kind of polystyrene (#6) Styrofoam. METAL: All types of aluminum, steel & tin cans, bottles, trays, caps and foils. Don't worry about residues or crumbs, but please dump out food scraps and liquids if you can. NOT recyclable: The single-stream system does not accept scrap metal items, light bulbs, or electronic wastes. GLASS: All types and colors of glass bottles and jars. Don't worry about residues, but please dump out liquids if you can. NOT recyclable: The single-stream system does not accept lab glassware, windows, ceramics, or light bulbs. Materials sorting is done by WestRock Recycling at their facility just six miles south of campus at 2000 Industrial Blvd, off Fern Valley Rd. Watch videos and see photos of the sorting process WestRock uses. After sorting, like materials are bailed and shipped via rail or truck to buyers that will use them to make new products with recycled content. Learn more about UofL's Single Stream Recycling program which has been in place since 2010. In select buildings on campus, UofL has begun experimenting with a Commercial Dry Waste system in which all standard solid waste is put in one dumpster and sent to WestRock to sort out recyclables. This only works in locations with minimal "wet" wastes such as food and bathroom waste. In these buildings, any "wet" wastes from bathrooms and break rooms should be placed in the WestRock recycling dumpster in black bags that can be easily pulled from the recycling sorting line. All other wastes should be placed in the dumpster loose or in non-black trash bags. We began piloting this system at the School of Music in 2015 and in 2017 we removed landfill dumpsters (saving us $450/month) at the following locations: Urban Studies Institute, Service Complex, Steam & Chilled Water Plant, Stockroom, Lee Street Building, Myers Hall (HSC), and Grounds West. In 2019, we added Ernst Hall & The Phoenix House. We can recycle any electronic consumer items, including: all computers, monitors, televisions, printers, copiers, scanners, servers, networking equipment, fax machines, telephones and cellphones, RAM/memory, hard drives, battery backups, and peripherals such as keyboards, mice, speakers, AC adapters, and mixed computer cables/wires. As of November 2015, all these E-Scrap items are recycled by PowerHouse Recycling in Salisbury, NC. Their goal is to be a zero landfill facility. UofL pays no shipping costs and receives a modest per-pound payment for most items. UofL pays per-pound to recycle non-flat screen TVs and CRT monitors. In sum, E-waste recycling generates a modest amount of revenue for UofL. For example, our August 2016 truck load generated $3,576 in revenue for UofL. Watch a video of what happens to your E-waste when you recycle it at UofL! Surplus also accepts from UofL departments only CDs, VHS tapes, audio cassettes, floppy disks and DVDs for recycling. These items must be sent to the warehouse without cases or sleeves. Do not send electronic media that contains sensitive or University proprietary information. Refer to Information Security Office policy ISO PS016 for the proper disposal method of electronic media containing sensitive information. All these items contain toxins and reusable components which should be kept out of the normal waste stream. UofL has recycled a considerable quantity of E-waste in recent years: over 76,000 pounds in 2016 and 2015, 68,198 pounds in 2014, and 74,239 pounds in 2013! 1. A pick-up request for computer hard-drives and laptop computers must be submitted using the “Computing Device Surplus Certification” form. 2. All other electronic items with a UofL Property tag bar-code must be submitted on a “TRANOVER” form (regardless of value). 3. All other electronic items valued over $1000 must be submitted on a “TRANOVER” form. 4. All other electronic items valued under $1000 should be submitted on a “TRANUND” form. Step 2: After your form has been submitted on-line and has been reviewed by the appropriate department, Physical Plant personnel will come to your location and pick up designated items for reuse or recycling. UofL also has a Printer Cartridge Recycling program for departments. Simply contact the Stockroom at 852-5890 to obtain a cartridge collection container and then alert Stockroom personnel when the collection container needs to be emptied. Pickup will be made as regular deliveries from Central Receiving are made in your area. Did you know that UofL recycles over 4500 pounds of batteries every year? The Department of Environmental Health & Safety (DEHS) manages the collection and recycling of batteries for the University. DEHS offers departments green buckets to collect batteries for recycling and over 50 green buckets have been placed at various departments throughout Belknap, HSC, and Shelby campuses. When the battery recycling container is near full, University personnel should submit a used battery pick up request on-line. 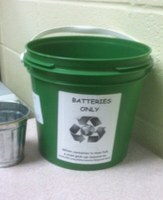 DEHS provides buckets for battery recycling collections. On-site battery recycling is now available through University housing! Students living in Bettie Johnson Hall, Community Park, Center Hall, Kurz Hall, Louisville Hall, Medical-Dental Apartments, Miller Hall, Threlkeld Hall, Unitas Tower & University Tower Apartments can drop off their used batteries for recycling at the housing Front Desk. Recycling tip: “Reduce, Recharge, and then Recycle!” Whenever possible use rechargeable batteries. The best rechargeable batteries are the “low self-discharge” Nickel-Metal Hydride (Ni-MH) cells. These low-discharge batteries have a lot going for them: they come fully charged (like alkaline batteries), and they can hold their charge over many months. Because they can hold their charge for so long, they are suitable for low-drain devices like remote controls and flashlights. Fluorescent light tubes and compact lamps contain a small amount of mercury. Recycling is the only responsible method of handling lighting waste. Fluorescent lamps are recycled for their mercury (Hg) content and comprehensive recyclers can also recover other metals, soda glass and phosphor powder from fluorescent bulbs. The Department of Environmental Health & Safety (DEHS) manages the collection and recycling of lamps for the University. Physical Plant personnel collect and transport these spent lighting wastes generated from routine service and maintenance operations to several designated DEHS managed accumulation sites. University departments can submit a used lamp pick up request on-line. On-site compact fluorescent lamp recycling is now available through University housing! Students living in Bettie Johnson Hall, Community Park, Kurz Hall, Louisville Hall, Medical-Dental Apartments,Miller Hall, Threlkeld Hall, Unitas Tower & University Tower Apartmentscan drop off their used bulbs for recycling at the housing Front Desk. It is very important to place the used bulb in a bulb box to prevent breakage and mercury leakage. If the original box is not available, students can request a foam pouch at the Front Desk. While replacing the fields at UofL's football stadium and Patterson baseball stadium in 2013, UofL recycled 226,000sf (123,470 lbs) of synthetic turf and reused 1.65 million lbs of sand & rubber infill! Read more. DEHS also collects other items which contain mercury, such as thermometers, tilt sensors, temperature switches, barometers, manometers, and thermostat probes. 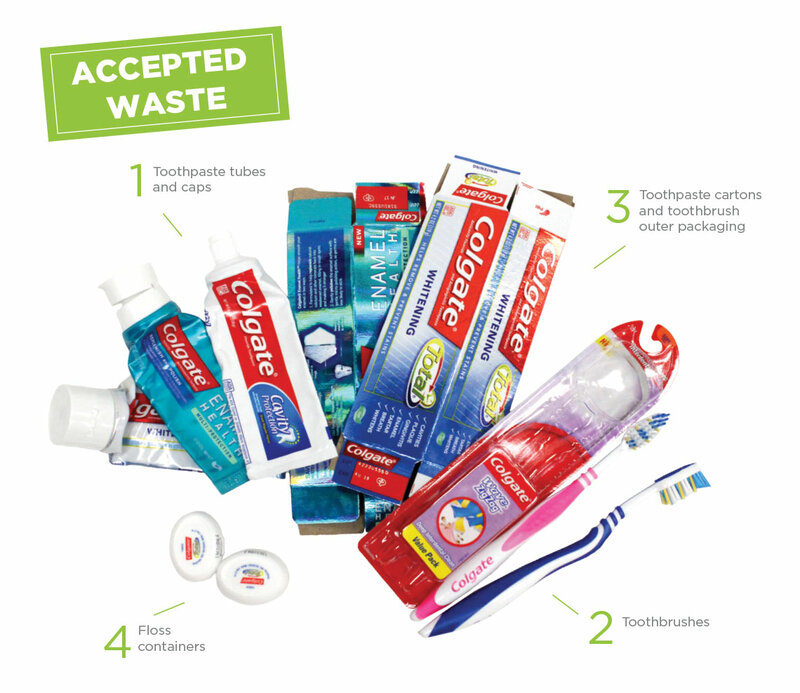 The UofL Dental School hosts a recycling bin in the lobby at the main entrance for oral care product packaging, including toothpaste tubes/caps/cartons, toothbrushes and toothbrush outer packaging, and floss containers. Once collected, the tubes and brushes are sent to Terracycle, separated by composition, shredded and melted into hard plastic that is remolded to make new recycled products. Learn more. UofL recycles Waste Cooking Oil from our dining facilities. > In 2017, 3,429 gallons was collected for local biodiesel and national yellow grease commodity markets. > In a 2011-13 partnership with the Louisville Biodiesel Cooperative and Kelley Green Biofuel, our waste oil was converted locally into renewable fuel used by the UofL Grounds Crew. 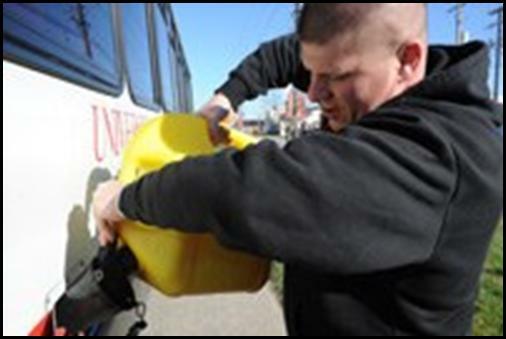 > As early as 2009, UofL Chemical Engineering students were involved in converting our waste oil into biodiesel for the campus shuttle. 2. Clean Styrofoam coolers used in shipping can be reused! For on-campus reuse, contact Cathy Price (Dept. of Environmental Health & Safety) at 502-852-2956. Also, the local non-profit Supplies Overseas can use such coolers (and other things like saline bags) for shipping medical supplies to needy communities. They accept drop-offs at their warehouse (1500 Arlington Ave.) 8am-4pm, Monday-Friday. 502-736-6360. Request a recycling pickup at your location. Get all the details on Physical Plant's recycling operations here. For questions regarding recycling of toxins such as batteries, chemicals, and light tubes, please contact the Hazardous Waste Coordinator, Cathy Price (Dept. of Environmental Health & Safety) at 502-852-2956. For all other recycling inquiries please contact UofL's recycling coordinator, Greg Schetler (Physical Plant) at 502-387-0707. Got personal stuff to recycle? Learn what can be recycled off-campus in Louisville, including electronic waste! UofL is turning organic wastes into valuable fertilizer! Learn how. Get your hands dirty with UofL's Composting Project! Please contribute any plant-based wastes such as coffee grounds, tea bags, fruit peels, vegetable scraps, bread waste, leaves, paper towels, paper plates, paper napkins, shredded newspapers & cardboard, etc. Start a compost collection in your building! All it takes is a dedicated volunteer willing to bring a bin out to the curb on a Friday afternoon and back into the building on Monday morning. The UofL Community Composting Project will come by over the weekend to collect your organics. To start the wheels turning, contact the Project Director, Brian Barnes, 502-338-1338. UofL's surplus property exchange programallows staff and faculty to swap reusable departmental items such as furniture, equipment, electronics, and supplies. Surplus items no longer needed by the University may be donated to another state/governmental agency or non-religious non-profit organization. Unclaimed items are periodically auctioned to the public. UofL also donates unwanted building materials, furniture, and appliances to Louisville's Habitat for Humanity ReStores where they can get a new life while raising funds for affordable housing projects. In Fall 2013, students in Group Recycling And Sustainable Solutions (GRASS) joined forces with the UofL Sustainability Council and Campus Housing to open a permanent Free Store in the basement of Unitas Hall (enter from Cardinal Blvd near Brook Street). The UofL Free Store is a space for the on-going free exchange of clean, durable items like clothing, shoes, electronics, small appliances, household items, bath & beauty supplies, books, school & art supplies, non-perishable food, and more. Donations can be made any time in the red bins at the base of the driveway just east of Unitas, off Cardinal Blvd. In 2017 alone, the Free Store helped keep over 700 pounds of items out of the landfill! UofL promotes an inclusive environment for all, regardless of gender identity and/or gender expression. The Free Store is a Transgender-Friendly space. The store is run by volunteers and is open to all UofL students and employees set hours each week during the regular academic year. Volunteers wanted! Follow the Free Store on . 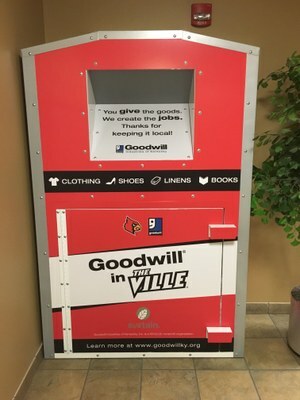 During Move-Out Time, UofL residents are encouraged to donate and exchange reusable items through the "Lighten Your Load" (formerly "Give and Go") collections and associated Free Stuff Swap hosted at the end of the year by Campus Housing in partnership with Goodwill Industries of Kentucky. During UofL's 2018 Lighten Your Load Move-Out Waste Reduction campaign, students donated 4,751 pounds of reusable goods to Goodwill! Look for signs and collection bins in residence hall lobbies as you think about moving out! *2016-17 rates were significantly higher due to many new campus construction projects, including the demolition of Crawford Gym and the Student Services Annex which together generated nearly 17,000,000 pounds of demolition waste which was recycled in 2016. The primary cause for the 2011 drop in landfill diversion was an unusually high percentage of construction debris in our waste stream that could not be recycled. In 2017, our landfill diversion rate without construction/demolition waste was 42.9%. Our landfill diversion rate was higher in 2012-13 because we were able to recycle coal ash from the shared central steam & chilled water plant at the downtown Louisville Medical Center. In more recent years, we have not been able to find a recycler for coal ash, especially as we now add lyme during combustion to reduce hydrochloric acid emissions. In 2017, our landfill diversion rate without coal ash was 81.1%. UofL competes annually in this friendly 8-week competition among university recycling programs to reduce waste, increase recycling and composting rates, and raise conservation awareness across campus! Keep up with the Cards progress at the RecycleMania website. Drink & serve Louisville's award-winning tap water instead of bottled water. Fill up your bottle easily at one of our many filling stations around campus! Use reusable cloth towels, wipes, and sponges instead of disposable paper products. If you must use copy/print, choose double-sided or the blank side of scrap paper! Eat & drink with reusable mugs, cups, plates, utensils & cloth napkins rather than disposables. If you're headed out, bring your own! At UofL Dining outlets and some area coffee shops & other outlets, you'll earn significant discounts when you use your own reusable mug/bottle for drink purchases! Use reusable filters instead of disposable ones in your coffeemaker, furnace, etc. Use rechargeable batteries rather than single-use, toxic disposables. >> Recycling All You Can! 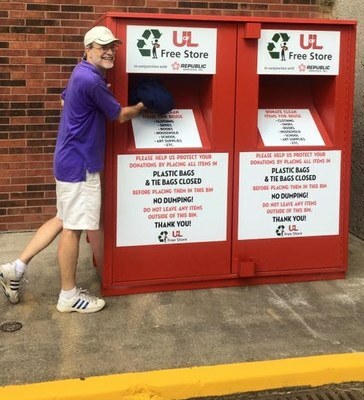 Fully utilize UofL’s amazingly easy, Single Stream Recyclingsystem that lets you recycle everything in the same bin: all types of plastic, paper, cardboard, metal, and glass! Recycle all types of batteries, lighting, printer cartridges, lighting, chemicals, and cell phones at UofL. Donate clean, unwanted items to the UofL Free Store in the basement of Unitas Hall (enter from Cardinal Blvd near Brook Street). Donations now accepted 24/7 in the large red bin at the bottom of the ramp next to the Free Store. The UofL Free Store is a space for the on-going free exchange of items like clothing, shoes, electronics, small appliances & furniture, household items, bath/beauty/health supplies, books & media, office/school/art supplies, non-perishable food, and more. UofL's surplus property exchange program (1901 S Floyd St.) allows staff and faculty to swap reusable departmental items such as furniture, equipment, electronics, and supplies. Surplus also handles UofL's E-Waste recycling program for any departmental electronic consumer items, including computers & peripherals, monitors, TVs, printers, copiers & more. We are competing in the E-waste Recycling category, as well! We can recycle any electronic consumer items, including: all computers, monitors, televisions, printers, copiers, scanners, servers, networking equipment, fax machines, telephones and cellphones, RAM/memory, hard drives, battery backups, and peripherals such as keyboards, mice, speakers, AC adapters, and mixed computer cables/wires. Please make sure your data has been wiped from your device before recycling. Simply drop the items in the E-Waste Collection bins in the lobby of any participating residence hall: Bettie Johnson Hall, Community Park, Louisville Hall, Miller Hall, Kurz Hall, Threlked Hall, Unitas Tower, UTA. In the Diversion category, UofL upped our game from 2017, again finishing #1 in the state and 19th out of 171 nationally, with an overall Recycling Rate of 57.05% during the 8-week competition from February 4th to March 31st, 2018. Full Results here. UofL came in 2nd in Kentucky for the Per Capita Classic, having recycled 14.426 lbs/person (70th nationally). In Total Recycling, UofL finished 2nd in the state and 53rd in the nation, recycling 358,729 lbs. over 8 weeks. UofL was the only Kentucky school to enter the Electronics Waste Recycling competition, finishing 46th in the nation after collecting 300 lbs (or 0.012 lbs/person) of electronics for recycling. In the Grand Champion category, UofL was #1 in the state and 37th out of 190 nationally, with an overall Recycling Rate of 53.885% during the 8-week competition from February 5th to April 1st, 2017. Full Results here. UofL came in 2nd in Kentucky for the Per Capita Classic, having recycled 10.777 lbs/person (102nd nationally). The Cards also did a whole lot of composting, nearly doubling our 2016 numbers and keeping 3.719 lbs/person of food waste out of the landfills (ranking us 72nd nationally and 2nd in Kentucky behind Berea College). In Waste Minimization, UofL finished 2nd in the state and 35th in the nation, generating 26.903 lbs/person of total waste. UofL was the only Kentucky school to enter the Electronics Waste Recycling competition with our pilot E-waste collection of 233 lbs of electronics on February 13th. All together, this translates to reducing UofL's greenhouse gas emissions by 451 Metric Tons of carbon dioxide equivalent (or the same as taking 89 cars off the road, or the energy consumption of 39 households). In the Grand Champion category, UofL was #1 in the state and 36th out of 208 nationally, with an overall Recycling Rate of 50.23% during the 8-week competition from February 7th to April 2nd, 2016. Full Results here. UofL also landed the top rank in Kentucky for the Per Capita Classic, having recycled 12.4 lbs/person (105th nationally). The Cards also did a whole lot of composting, keeping 2.3 lbs/person of food waste out of the landfills (ranking us 2nd in Kentucky behind Berea College). All together, this translates to reducing UofL's greenhouse gas emissions by 434 Metric Tons of carbon dioxide equivalent (or the same as taking 85 cars off the road, or the energy consumption of 38 households). In the Grand Champion category, UofL was #1 in the state and 15th out of 232 nationally, with an overall Recycling Rate of 63.5% during the 8-week competition from February 1st to March 28th, 2015. Full Results here. UofL also landed the top rank in Kentucky for the Gorilla Prize, having recycled at total of 245,859 lbs, or 7.2 lbs/person (Per Capita Classic). The Cards also did a whole lot composting, keeping 2.7 lbs/person of food waste out of the landfills (ranking us 2nd in Kentucky behind Berea College). All together, this translates to reducing our greenhouse gas emissions by 258 Metric Tons of carbon dioxide equivalent (or the same as taking 51 cars off the road, or the energy consumption of 22 households). In the Grand Champion category, UofL was second in the state (behind JCTC) and 116th out of 256 nationally, with an overall Recycling Rate of 29.7% during the 8-week competition from February 2nd to March 29th, 2014. Full Results here. UofL recycled at total of 101,332 lbs (taking 1st place in the state for the Gorilla Prize), or 5 lbs/person (Per Capita Classic). That translates to reducing our greenhouse gas emissions by 142 Metric Tons of carbon dioxide equivalent (or the same as taking 28 cars off the road, or the energy consumption of 12 households). In Waste Minimization, UofL finished first in the state and 20th out of 168 nationally, with a total waste generation of 14.655 lbs/person.Full Results here. In the Grand Champion category, UofL was second in the state (behind JCTC) and 37th out of 274 nationally, with an overall Recycling Rate of 48.87% during the 8-week competition from February 3rd to March 30th, 2013. UofL recycled at total of 144,766 lbs (taking 1st place in the state for the Gorilla Prize), or 7.16 lbs/person (Per Capita Classic). This total includes 3.49 lbs/person of Paper, 2.15 lbs/person of Cardboard, 1.52 lbs/person of Bottles & Cans, and 2.73 lbs/person of Food Service Organics. That translates to reducing our greenhouse gas emissions by 335 Metric Tons of carbon dioxide equivalent (or the same as taking 66 cars off the road, or the energy consumption of 29 households). From February 5th to April 5th, 2012 UofL competed with 605 colleges and universities across the continent and recycled 174,864 pounds of waste, or 7.17 pounds/person. Full Results here. That translates to reducing our greenhouse gas emissions by 116 Metric Tons of carbon dioxide equivalent (or the same as keeping 62 cars off the road, or the energy consumption of 31 households). UofL finished 43rd in the competition for waste minimization, reducing our trash by 21.39 pounds/person. We finished 69th in terms of Corrugated Cardboard, recycling 4.81 pounds of cardboard/person; and 109th in Food Service Organics, composting 0.49 pounds of organics/person. 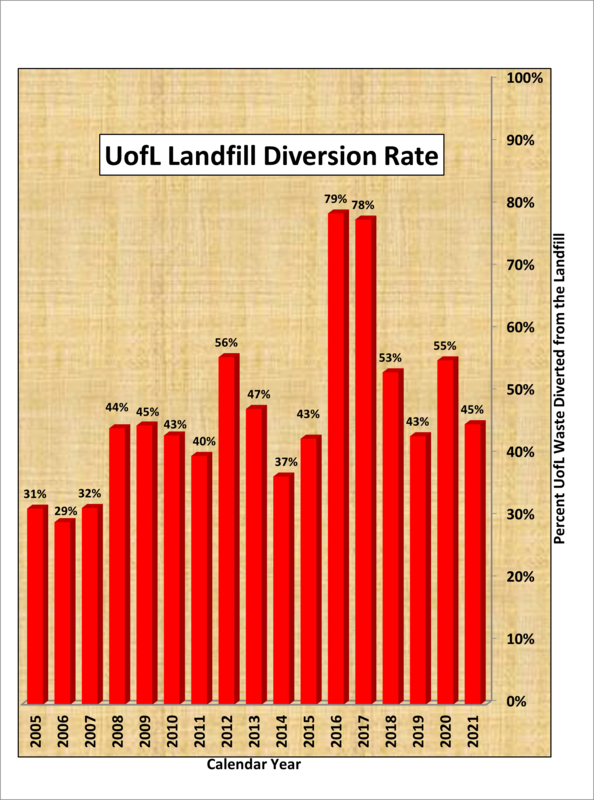 UofL achieved a weekly recycling rate of 33.51% (98th). 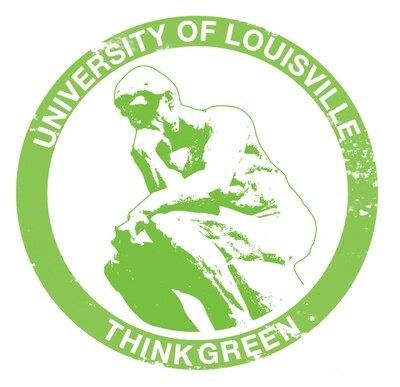 During RecycleMania 2011, UofL recycled 241,782 pounds of waste, or 10.91 pounds/person, with a recycling rate of over 36%...beating the University of Kentucky in 4 out of 7 categories! Full Results here. Check out our hilarious, blast-from-the-past 2011 RecycleMania Cardinal Cam Video!